does pcem support slip or ppp (or even modem handshaking? ), ot at least some bidirectional connection method for emulated serial ports? I have a strange expirience made with your PCem version. This version has problems with the year 2016 (even in BIOS settings), but I guess it isn’t related with the year, instead, it’s related with CMOS memory handling. The BIOS setup is not saved, you can try hard and “Save & Exit” BIOS settings more than once, still every hard reset/new start of PCem will result in CMOS settings error message. Oh I thought it was just me doing something wrong… I’ll have to check then. 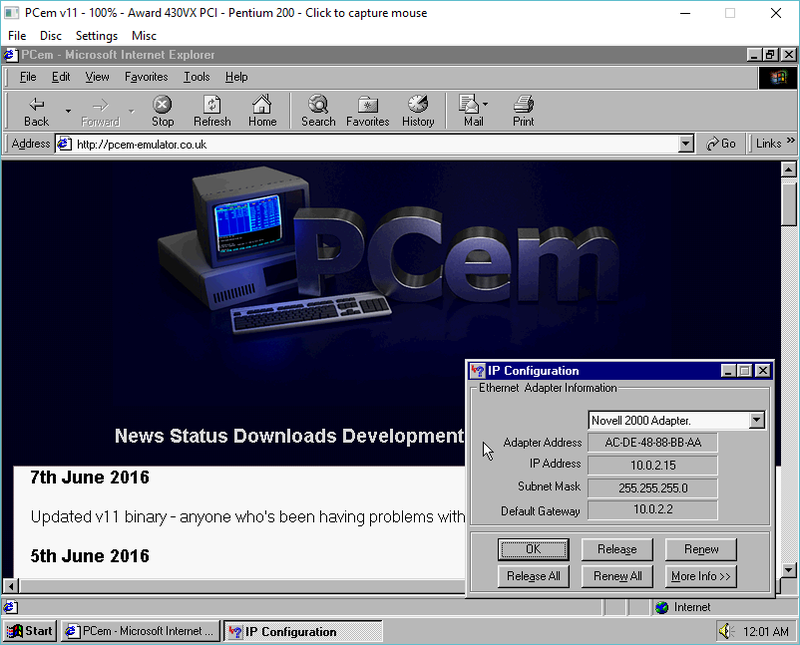 Is the 64-bit version of PCem v11 with networking support? I did use earlier versions of PCem with networking support and it did work under Windows Vista. I was hoping to find a way to fix this. I haven’t tried to build with win64, as Ive always had bad luck with gcc+win64.. I should also add that a grep of SymSetScoreFromAddr reveals nothing in the source so it’s not explicit. I found a typo, it’s SymSetScopeFromAddr and it’s found in Debugging Tools for Windows 6.8 and later. So it seems that this entry existed before Windows 7 was even released. Can confirm, can someone please post on pcem forum about that? I rebuilt from the stock source I downloaded, and it does the same thing. Can confirm, can someone please post a bug on pcem forum about that? The (windows) binary I downloaded from http://pcem-emulator.co.uk/downloads.html does not have the problem. well the source has the exact same issue for me. One note for the BIOS error… do you guys have a nvr folder under your pcem folder? PCem doesn’t seems to create the folder by itself. I can save my changes without any problems. Yes, it solves the problem. Because I downloaded first the extended version of PCem, I had no comparison. May be it will be a good idea to add the nvr subdir to the offered ZIP, or may be drop an additional note about it. Neozeed, you are the man! Thanks for the network updated version! Thanks for your network version. It is awesome! IBM AT(286) + NE2000 Packet driver works very well. IBM XT(8088) + NE2000 Packet driver doesn’t work. IBM XT(8088) + 8-bit mod NE2000 Packet driver doesn’t work too. Time out waiting for ARP response.